We always bring professions to the product in evey details whether in the source of product, the quality, or the price. And we have been devoting ourselves to providing the best service,and the best wearing experience for every cutomers!Your satisfaction is our Pursue! 1. JIELIELE wrist bands is compatible with Fitbit Versa, allowing access to all controls , buttons, sensors and any other Fitbit Versa Smart Watch features. 2. Unique framed protective case one-piece with the strap can perfectly protect your Fitbit Versa watch by 360-degree. 3. The length of the Fitbit Versa watch strap fits for 6.00-8.60inches (150-216mm),thoughtfully suitable for women/men. 4. Easy to assemble and remove through pins in seconds. 5. Different colors for you to choose, to meet with all kinds of preferences. and medium in thickness, soft in silicone and more comfortable to wear. Suitable for all the sports activities. We offer various colors for you to choose - Black, Gray, Purple, Cyan, Pink. so as to personalize your smart watch creating creates a sleek and stylish look. The Fitbit Versa Watch is NOT Included. Please take the watch off when charging. The watch strap is made of natural and non-toxic silicone.Soft, lightweight, resilient to be twist by 360 degree freely with shock absorption and excellent resistance to UV.Also waterproof and breathable, which makes you feel comfortable when you do exercise and feel relaxed for daily and nightly wear. 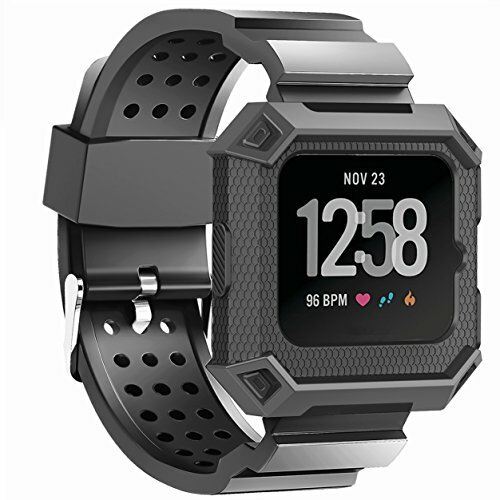 The silicone wrist strap designed with full-body framed case,surrounds your Fitbit Versa perfectly and hold it tightly, provides greatly ultra protection for avoiding the direct physical impact with the ground or elsewhere. And effectively prevent dust and other sundries from entering the watch. The buckle is made of imported 316L stainless steel. With exquisite craft and technology of polishing and grinding, the buckle is smoothly rounded on the corner,and closely joints with the strap. The wrist band fits 6.00-8.60 inches (150-216mm) wrist. Uniqueltiple breathable round holes meets with the ergonomicsnot for humanity design,which not only further reduces the weight of watchband, but also enhances breathability for your hand skin, keeps your wrist cool and avoids suffering skin irritation. If you have any questions about this product by JIELIELE, contact us by completing and submitting the form below. If you are looking for a specif part number, please include it with your message.